When a week dies, a collection of funniest tweets is born from it for your twisted Twitter-loving pleasure. If you missed last week’s tweets, we highly recommend you not skip your weekly dose of laughs, if nothing else for your health. Enjoy this heaping pile of hilarity, then scurry off into your weekend, but first, remember to follow these fine folks on Twitter. Their blood, sweat and tweets did not come easily, but again, neither did your weekend. Side effects may include: loss of bladder control, unemployment and unplanned crying. Q: What does Mike Pence say when he orgasms? Someday I hope to be a big enough star that I can disappoint people by appearing in a Superbowl ad. Hi. I think my boyfriend is cheating, and I’m looking for a grief counselor. 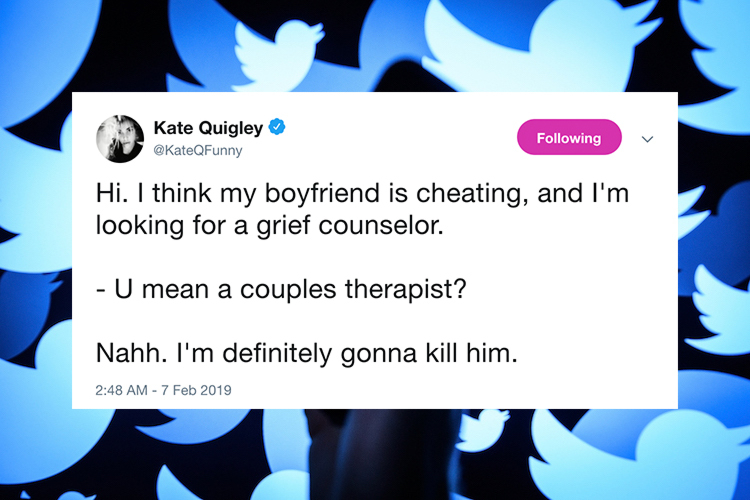 – U mean a couples therapist? Nahh. I’m definitely gonna kill him. Welcome to your 40s. You cannot go out two nights in a row anymore and your face is suddenly a potato. Have fun! ME: Maybe wave your gun around?